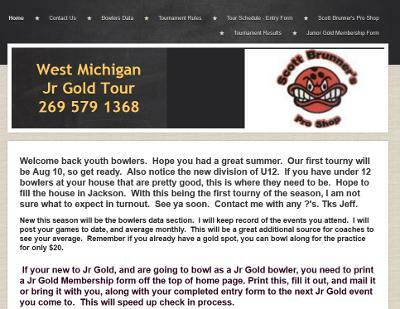 Jeff – the owner of the Western Michigan Junior Gold Tour website – contacted us last week. He inquired about having us change some items on his current website. His current website is hosted with another provider – and he had someone create the website for him a while ago. Jeff told us that he talked to a few other website design people and none of them were interested in helping him out. Jeff said that the other website designers made him feel like they were too busy to be bothered to make the changes that Jeff requested. Here at BsnTech Networks, we were very happy to help Jeff with his website maintenance needs. He did need very few changes – and we provided him a very great, affordable rate for his website maintenance. We are hoping that in the future, he will have us fully create a new website for him and bring it under our highly reliable hosting servers. He currently is paying his other provider twice what our cost is per month for website hosting – so it will take him a little over 18 months to start saving money each month after the quote we provided him to create a new website for him. No matter how small the website updates or maintenance needed, BsnTech is happy to help.